The global elites of business and politics have no idea of the contempt with which they are viewed, John McDonnell said today in Davos as he vowed the biggest clampdown on tax avoidance in global history. The shadow chancellor, who is making his first appearance at the World Economic Forum, delivered a fresh broadside as he called on chief executives and politicians from the major economies to take their share of responsibility. McDonnell spoke out as billionaire US president Donald Trump told ITV he is willing to apologise for sharing posts from a British far-right group on social media. It is McDonnell’s renewed assault on the “rigged system” that is likely to prompt most attention in the labour movement. The longtime ally of Jeremy Corbyn drew a comparison between the luxury of the Swiss ski resort and the lives of billions of people who live in poverty around the world. “The status quo allows a powerful few here in Davos to sit in splendour whilst the great many lose out,” McDonnell said. “But the status quo is not inevitable. It is the product of a rigged system, and systems can be changed. McDonnell spoke about the importance of tackling tax havens and closing tax loopholes when he appeared at a panel event today. He later gave an interview in which he set out why he had decided to attend the event, whose other guests include David Cameron and George Osborne. “Why did I come? Firstly, I got an invitation and I thought this was the time to check just what the discussions were, what the assessments being made by individuals were and what the feelings were about the future. Secondly, to deliver a message that people need to look at things like the result of Brexit and address the issues that caused it,” he told The Guardian. 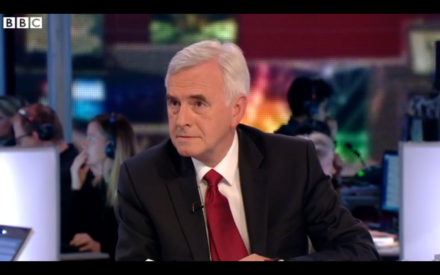 McDonnell also described a host of measures which he said a Labour government would take to curb tax avoidance. “There should only be ‘havens’ for those fleeing persecution in our world. Not those fleeing commonly acceptable tax jurisdictions. This has been spurred on by some countries pursing a race to the bottom in corporation tax rates and supplied by accountancy firms pushing aggressive tax avoidance schemes. “But we must go further, to break the culture of aggressive tax avoidance. Labour in office will introduce the most comprehensive programme to combat tax avoidance ever implemented by a developed economy.